A lawn and landscape that’s well lit with a great landscape lighting system gives the appearance of a cohesive whole. But in fact, each lighting system is the sum of many different units. 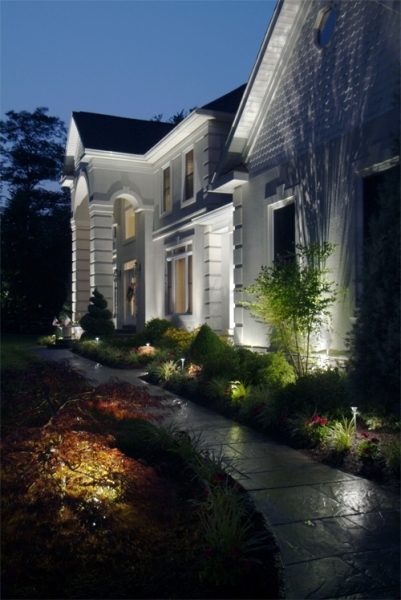 Each landscape lighting system is composed of a multitude of individual light bulbs. But each of those light bulbs is performing a specific task, and providing a combination of utility and artistry that contributes to the overall impact and appearance of the system. Different types of bulbs, employed in different methods, each contribute a unique ingredient that’s blended into the whole. One of those bulb-ingredients that’s heavily employed in most landscape lighting systems is floodlights. The name “floodlight” implies a light that will cast a great glaring swath of blindingly brilliant light across the property. But – at least in landscape lighting terms – that’s not how floodlights are used. Instead, floodlights are used typically to cast a warm glow from low to high, generally with the purpose of highlighting a particular architectural or landscaping feature. Front entryways are features that are frequently set aglow with floodlights. A chimney, a large expanse of brick facade, a massive and stately tree – these are the types of features that are often emphasized with the use of floodlighting. The term ‘floodlight’ applies to quite a variety of bulbs. Each holds common the ability to cast a large glow. But one variety of floodlight may cast quite a different pattern than another. The difference lies in the beam angle of the bulb. A wide variety of beam angles are available for floodlight bulbs and fixtures. Different bulb designs are also available. Halogen and LED bulbs are currently among the most popular types of floodlight bulbs. As with all other aspects of landscape lighting, using floodlights to their maximum effect requires somewhat of an artist’s eye. The best lighting system contractors appraise a property as though it were a blank canvass, and the multitude of available bulbs and fixtures the artist’s palette. And that certainly applies to making the best use of landscape floodlighting. Floodlights are easy to overuse in an outdoor lighting system. But when used judiciously and selectively, they make a dramatic contribution to the overall appearance of a well-lit landscape. After all, designing a landscape lighting system is rather like baking a cake: you must select only the proper ingredients, and apply each in just the right amount. Do otherwise, and the result will disappoint. Floodlights are just one of many ingredients used to ‘bake’ an exquisite landscape lighting system. But it’s a very important ingredient. This entry was posted on Wednesday, April 6th, 2016	at 6:44 pm	. You can follow any responses to this entry through the RSS 2.0	feed. Both comments and pings are currently closed.